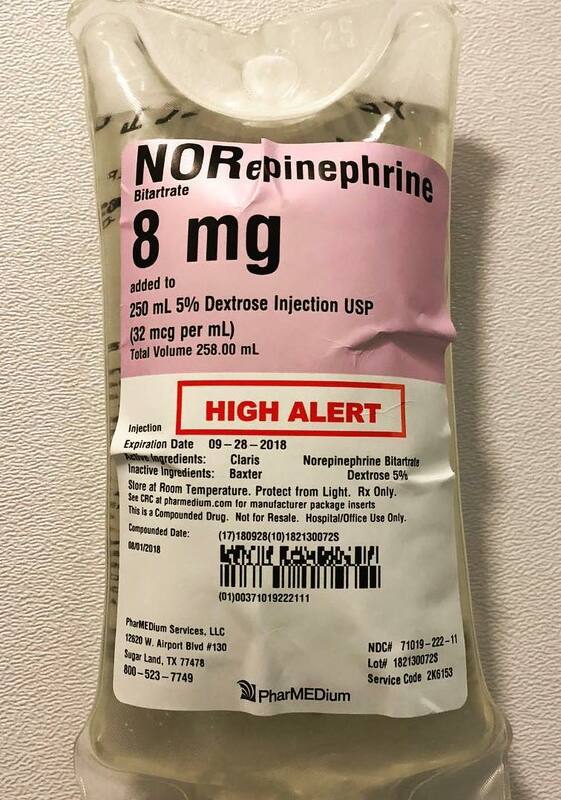 Norepinephrine (Levophed) is a powerful, endogenous catecholamine routinely used in the ICU and perioperative settings. As a single agent, it works as an adrenergic agonist increasing vascular resistance, and to a lesser degree, cardiac output (inotropic/chronotropy augmentation) through alpha 1 and beta 1 mechanisms, respectively. I bolus and start norepinephrine infusions all the time in trauma and cardiothoracic cases where vasoplegia can contribute to shock/hypotension. For the same reason, norepinephrine is the “first line” pressor in septic shock. I usually cap my dose at 30 mcg/min, because I feel that beyond that, the patient is receiving more volume than additional efficacy as a pressor. Besides being involved in the stress response, LOW norepinephrine levels in the central nervous system have been implicated in ADHD and even depression providing the rationale behind using norepinephrine reuptake inhibitors (SNRIs) like venlafaxine and duloxetine as therapeutic agents. I always “test” patients with low doses of norepinephrine to assess the kind of hemodynamic response he or she will mount. I’ve seen 4 mcg of norepi take systolic pressures > 200 mmHg in older patients with stiff arterial vasculature, and 20 mcg of norepinephrine not touch the hemodynamics of a patient in full shock due to severe acidosis. Remember, you can always give more! Can you do one of these for Giapreza!! I’ve only used it once! Need to use it more before I have any experiences worth sharing!